The Paris Feast: Vin Chaud (Mulled Wine) to warm up this festive season. Vin Chaud (Mulled Wine) to warm up this festive season. It’s December and temperatures are dropping, so how about some Vin Chaud (Mulled Wine, the French name literally means Hot Wine) to warm ourselves. 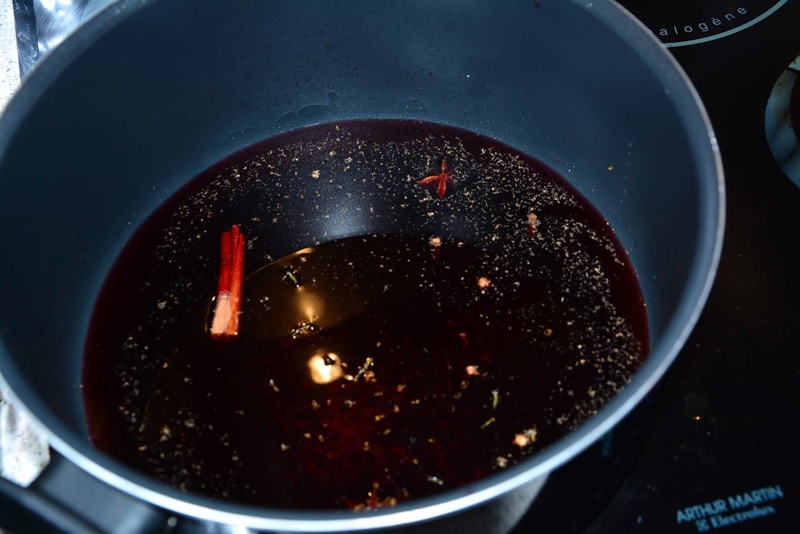 There are two advantages of making Mulled Wine, it is tasty and cozy and making it fills up the room with sweet smelling aromatics. 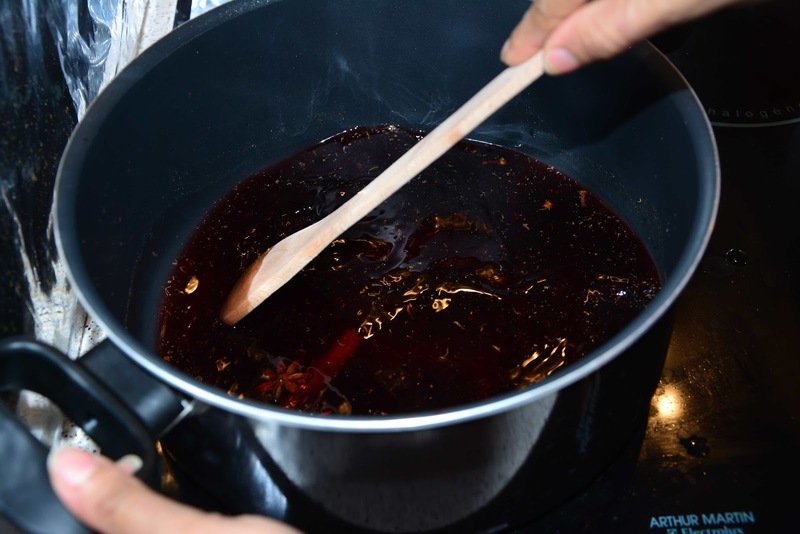 Mulled wine has a long history, the oldest record dating back to the Roman Empire around 20 A.D which was prepared by boiling wine with honey and then adding spices to it. 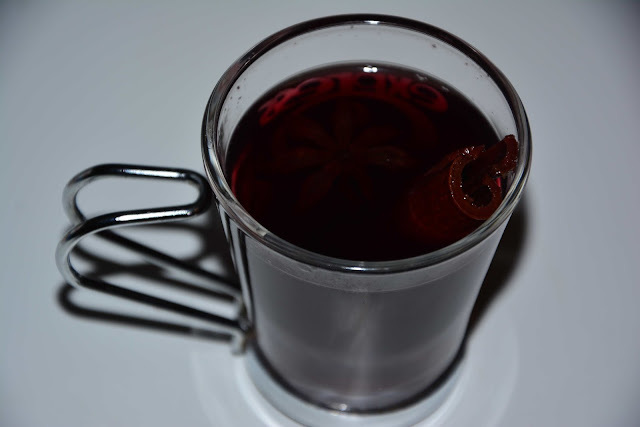 Since the 17th century, Mulled wine spread across Europe, with it being more popular in the Scandinavian countries where it is known as glögg in Sweden, gløgg in Denmark and glögi in Finland and is mainly prepared and consumed around Christmas. 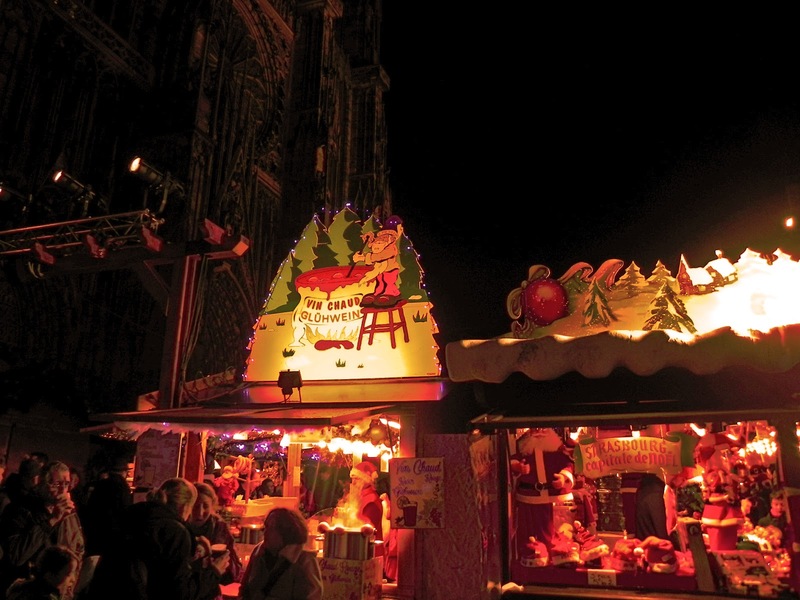 In the Germanic countries it is known as Glühwein and is a primary attraction of the Christmas markets held across the regions. 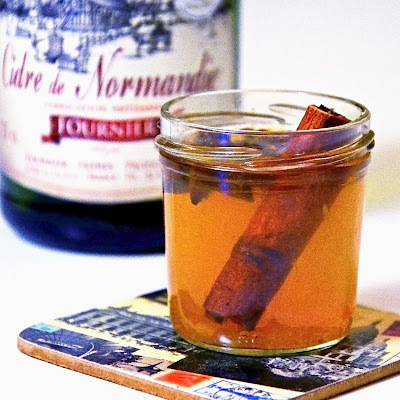 In France, Vin Chaud used to be available in almost all inns and was made by boiling wine with sugar and cinnamon during the late 19th Century. Now let’s get to the making of our own mulled wine. 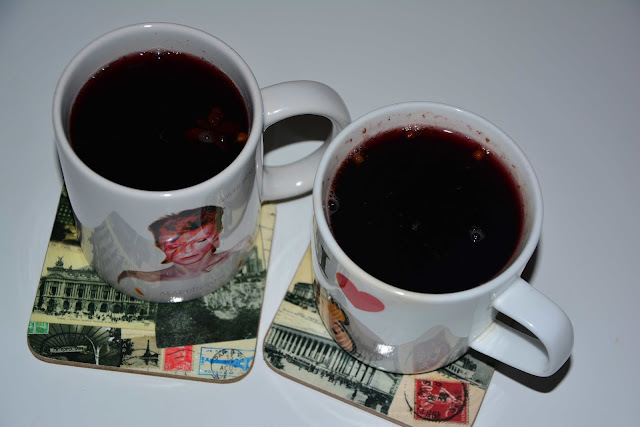 First and the most important ingredient of mulled wine is of course the wine. One has to be careful in choosing the wine. Surely it should not be expensive and not the best type of wine, else it would be better drinking it off rather than boiling. 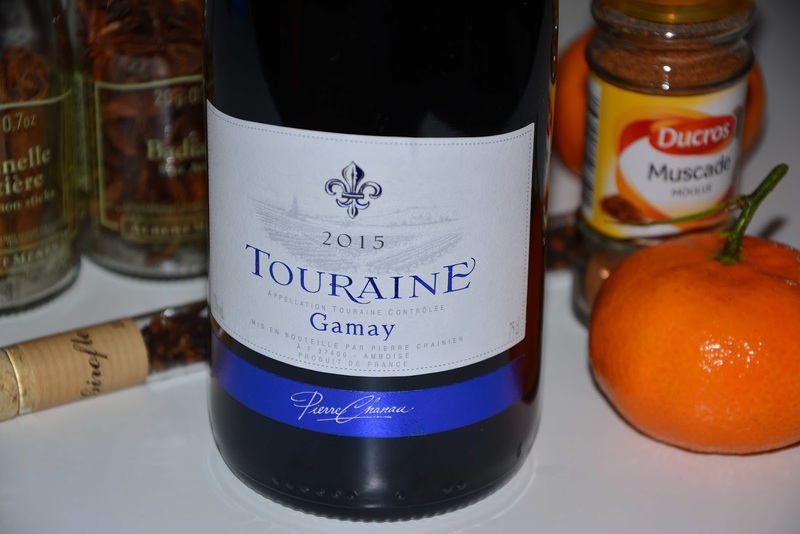 In France as I have mentioned in my previous blogs, there are a huge variety of wines given the wide range of climatic conditions available and the diversities of grapes that can be grown here. 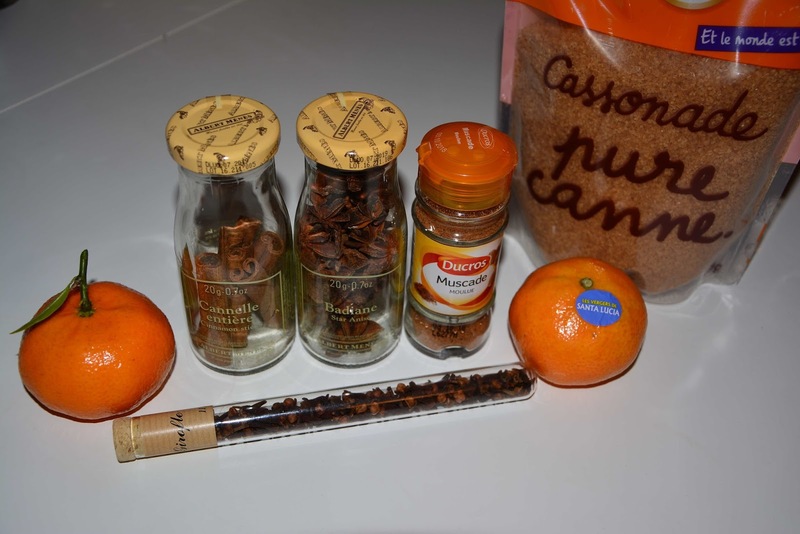 In general mulled wine is made with red wine though some white wine versions exist. The wine should be low in tannin content (it should not have a drying sensation in the mouth, tannins come from the skin and seeds of grapes), preferably less dry (with some fruity flavor) and light bodied (with lower alcohol content and lighter in color). So the grape types to strongly avoid are Cabernet Sauvignon, Syrah, Malbec and so on. Here I am listing only the grapes widely available in France. 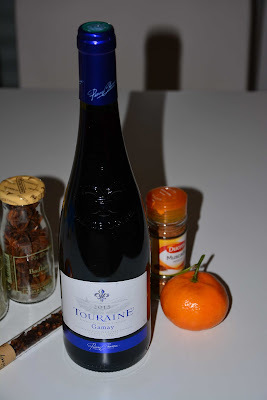 Thus given the characteristics some French grape types that would do really well for mulled wine are Cinsaut (found in South of France), Grenache (found in the wines from Rhone valley and in Spain) and Pinot Noir (Burgundy). 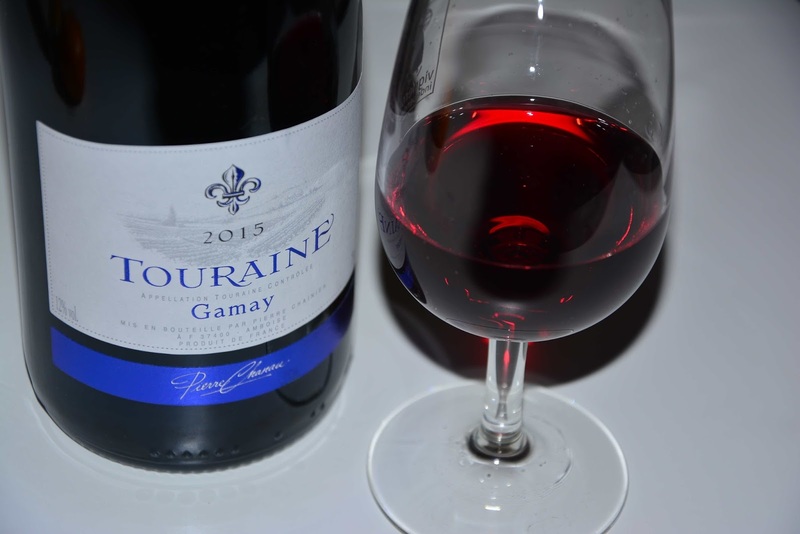 The best grape type for me is the Gamay which is light bodied and has mild fruity flavors. The Gamay is more popularly used in the Beaujolais region but I found a Gamay wine from Touraine (AOC) of the Loire valley which would be perfect for my mulled wine. The wine had mild flavors of cherry and raspberry with 12% alcohol content and a 2015 vintage and thus not at all dry. Having described the wine now let me come to the recipe of my French style mulled wine or Vin Chaud. 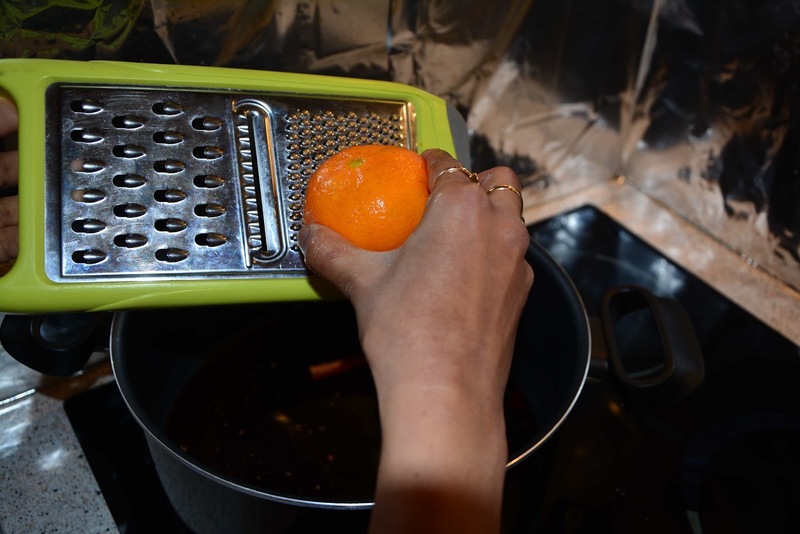 Orange jest (I used the jest of clementine which is sweeter and has lesser acid). Pour the wine in a deep bottomed vessel. Add all the other ingredients to it. 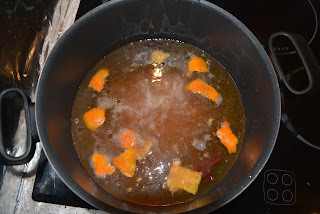 Switch on the heat to medium and keep stirring until the sugar melts. Once it starts to bubble, lower the heat. 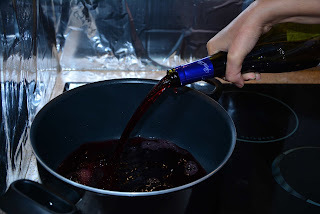 The wine should simmer but not boil. Simmer for at least 15-20 minutes so that the essence of the aromatics incorporates into the wine. Discard all the aromatics and serve it hot. 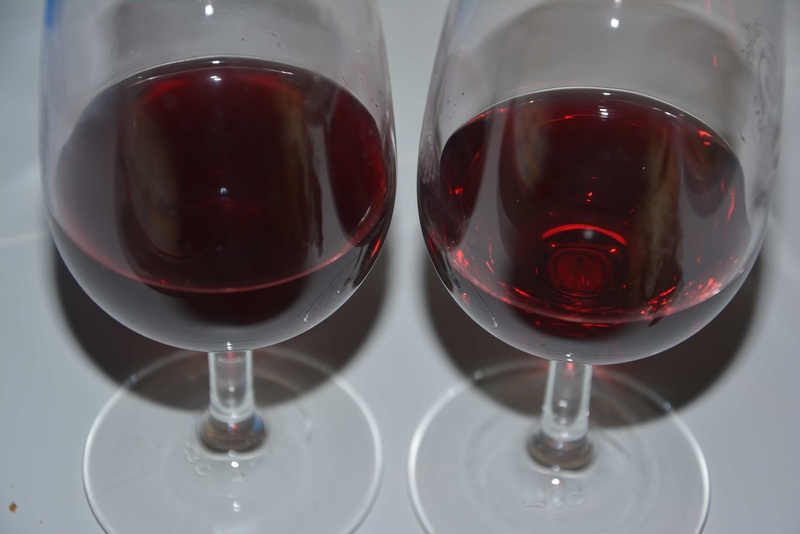 Here is a picture to show the difference in color between the original wine (on right) and the final mulled wine (on left) which is darker due to the added sugar. 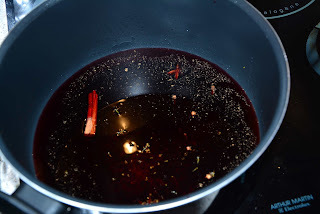 You can reuse the aromatics for at least two more batches of mulled wine. 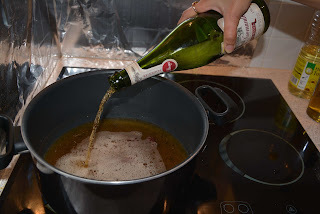 If you plan to try another liquor rather than wine, you have to wash the ingredients with water. For example, just after the mulled wine I made myself another batch using cider which is also popular in some parts of France and is called the Cidre Chaud. I had a sweet cider from Normandy and for the Cidre Chaud it is the same procedure but I also added the peels and the juice of one clementine to the mixture.